Unlike remote-controlled robots, autonomous robots control themselves. They don’t have a human being guiding them. If you watch autonomous robots fight, you'll notice that the robots often pass by each other without attacking. It is surprisingly difficult for a robot to see. Competitors make things even more difficult by painting their robots black, to reduce infrared reflection. Therefore, a robot that can find its opponent has a critical advantage. 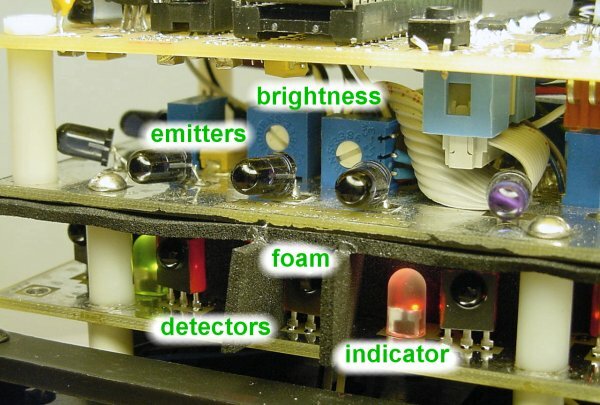 Most robots have only two infrared emitters and detectors. No.2 has ten emitters and eight detectors! No.2’s robotic vision system consists of infrared emitters and detectors, with LED indicators and trimpots for testing and adjustment. 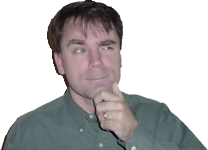 The correct brightness of the IR (infrared) emitters is crucial. If the emitters are too dim, a dark opponent at the far end of the sumo ring will not reflect enough of the infrared signal to be detected. If the emitters are too bright, the sumo ring itself or far-away spectators may be detected, causing the robot to drive straight forward or sit at the edge of the ring trying to attack an out-of-reach person. Additionally, the emitters must be balanced between each other, so that one side isn’t so much brighter that the robot has a tendency to veer rather than hitting an opponent robot straight on. To accomplish these goals, each infrared emitter connects to a trimpot (small potentiometer) that can be turned with a screwdriver to increase or decrease the brightness. That way, not only can the overall reflection distance be optimized, but the emitters can be balanced against each other. A bicolor (red/green) LED beside each detector indicates when a reflection is seen, which makes it easier to diagnose and fine tune. To further increase the targeting of the infrared vision system, No.2 has black foam sheets (available at hobby stores like Hobby Lobby) inserted between the infrared detectors. This prevents side or rear reflections from setting off the detectors. Before adding the foam, nearly the entire board full of detectors would light up when an opponent was near, because the reflected IR signal could travel across the board and into the sides and rears of all detectors, not just the fronts. Overhead of robot sumo infrared emitter board with (1) 74AC14 38kHz wave generator, (2) center hole for cables, and (3) a bunch of IR emitters. 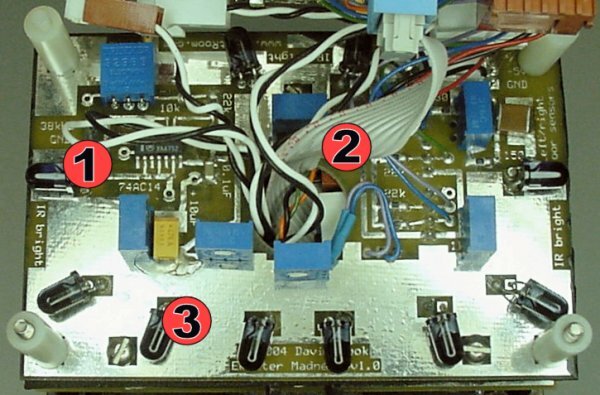 The infrared emitter board clusters most of the IR towards the front. This is because the sumo opponent should be in front of the robot most of the time. Both Sharp and Panasonic make remote control sensors that robot enthusiasts reuse as wall, obstacle, and opponent sensors. These detectors require a carrier wave or signal to detect. No.2 uses a simple inverter chip, a 74AC14 (see item #1 in the above picture) to create the base signal to feed into the emitters. 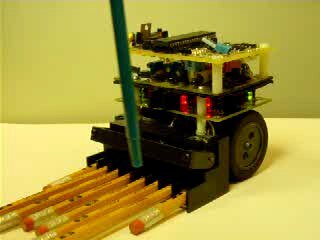 (You can learn how to make this circuit in chapters 11 and 12 of the book “Intermediate Robot Building”.) Believe it or not, the inverter chip powers all of the infrared emitters (in five pairs) directly -- no discrete transistor is necessary. Notice the center hole with the cable feeding through it? (Item #2 in the picture above.) This wiring goes to the floor sensors, motors, battery, and detector board. In hindsight, I wish I had used two microcontrollers connected by a two wire bus (like I2C) to reduce cabling. Lastly, notice the large shiny metal areas toward the front of the PCB? I tried to leave as much metal as I could above and below the board to reduce the amount of infrared signal leakage that could get directly to the detector board from the emitter board. Remember, we want the detectors to only see infrared reflected from the opponent’s body. While these metal planes probably screen out some electrical noise and other leakage, the exposed semi-translucent FR-4 substrate (light tan colored board) allowed two much infrared light to pass through. So, I had to add a whole layer of the black foam between the boards. Okay! Enough techno-babble! Let’s see it work. Click to see a movie of No.2’s infrared mini-sumo robot opponent detection system.